Pale St John’s Wort is another of the semi woodland St John’s Wort species, although I think it is more restricted to woodands, than the Slender St John’s wort. Still though, it is to be found in the more open areas and along paths. I have not seen it growing in Heathland like Slender St John’s Wort. I grows quite tall ( about one meter ) is quite common and flowers in late June and July, even August. The flowers are more cream yellow, ie more pale than some of the others. Also the black dots which are characteristic of this group of flowers are only found on the sepals and on the bracts immediately below the flowers. You can see them in this close up photo below. I am not sure of the function of these dots. On some plants dots and stripes on flowers are what are known as honey guides and are there to direct the bees and pollinating insects to the nectar. However in this species the dots are round the edge and obviously do not lead to the nectary. The dots are often referred to as ‘glandular dots’ This would suggest that they produce some sort of secretion. St Johns wort does contain various chemicals which can affect livestock if they eat it and which are of course used in herbal medicines. When eaten by livestock, St John’s wort causes photosensitisation of exposed skin (inflammation eg., of face, ears, lips), affects the nervous system of animals causing depression and hyperthermia (panting, salivation, respiratory distress) and alters heart, blood vessel and intestinal function. Chronic poisoning results in weight loss, reduced reproductive performance and death. Light-skinned and soft-skinned animals and those with white markings are the most affected. Those with thick, tough and pigmented skin are less affected. Early signs of clinical poisoning include agitation, pawing of the ground, rubbing of the head and face against fixed objects and mild diarrhoea. Leaves showing translucent oil glands. 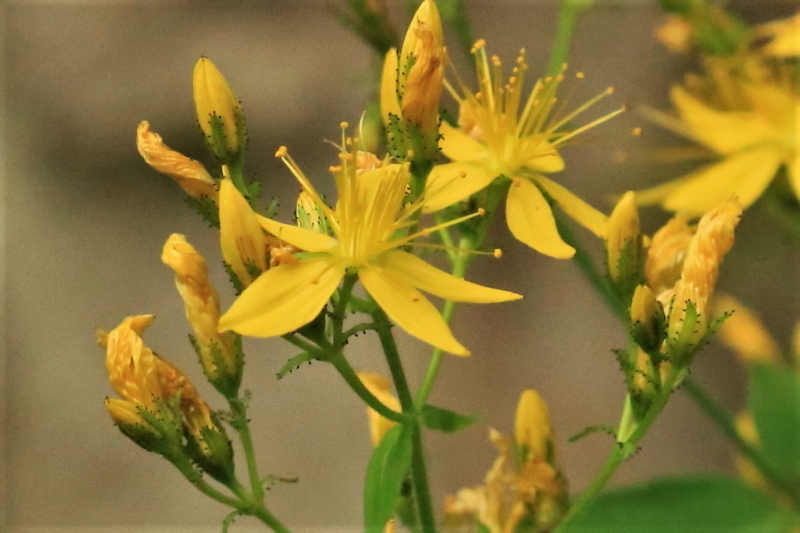 Hypericin, in the oil glands of St John’s wort leaves and flowers is the cause of the toxicity, but the effects depend on activation by bright sunlight of the poison circulating in the bloodstream. Tolerance of any animal to the poison appears to be directly related to the amount of skin surface protection it has. The minimum toxic dose of foliage for sheep is about 4% of live weight. Horses are more sensitive to hypericin than cattle and sheep, with goats the least sensitive. Recent studies indicate that Hereford cross cattle are two to three times more tolerant than Merino sheep. 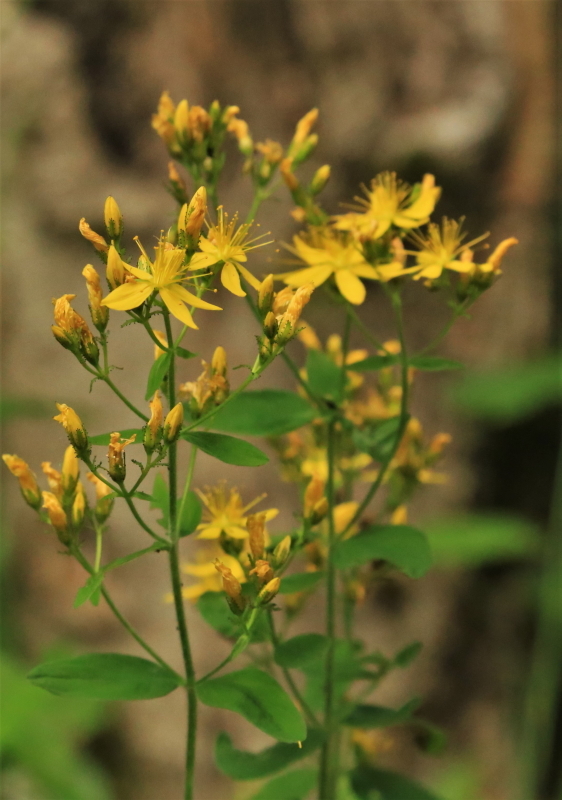 The amount of St John’s wort consumed to produce a toxic reaction is less when the plant is in flower or when animals graze the more toxic, narrow-leaved biotypes. Affected animals generally recover after 3 to 6 weeks once removed from access to the plant, but sheep with early signs of poisoning typically recover within 12 hours if they are moved indoors. Poisoning can reduce milk yield, and cause abortions in animals. The plant is more toxic when in flower and may contain more than 50 times more hypericin in early summer than in late winter. Narrow-leaved forms of the plant can be twice as toxic as broad-leaved biotypes. Plants become markedly more poisonous when the flowering shoots have grown 5-10 cm high. Hay containing St John’s wort also causes poisoning. The plant has a number of medicinal and pharmaceutical uses. So it would seem that it is likely that the dots are the source of the chemicals and are possibly produced to deter grazing animals from eating them.